nor be influenced by them. Is to live with Tao in the land of the void. he will not become angry. all because there is somebody in that boat. and he would not be angry. The straight tree is the first to be cut down. and you will not avoid calamity. "He who is content with himself has done worthless work. fame is the beginning of disgrace." The passage above seems to encapsulate the Taoists' view of a worthy lifestyle choice. 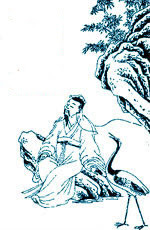 I like it: "He will flow like Tao, unseen .... his steps leave no trace." It describes a transcended state beyond ego and greed. It doesn't seem as if such a person would be responsible for any of the chaos we have in the world currently. No wars, crime or bank bailouts if the Taoists were perfecting our culture. Can this Tao flow in a Western capitalistic economy? "He has no power, he achieves nothing. To all appearances he is a fool." It seems counterintuitive. Perhaps, these guys are just too lazy to get a job and try to make something of themselves. No. There's something profound within this enigma and I'd like to understand it better. Somewhere in my Western cultural upbringing, a desire for achievement found its way into my psyche. I think most of us have it to varying extents. My own ambition motivated me to escape the small town culture that felt confining to an exuberant youth for a life in a more sophisticated, worldly culture that would prove more worthy of my disdain. We've been told that anyone is permitted to achieve anything s/he wants in a capitalist democracy. It's honorable to work hard and achieve much - even if a few eggs get broken in the process of cooking the omelet. According to dogma, achievement is rewarded by fortune in this country -- unlike those other countries. Thus, fortune has become a reputed measurement of achievement -- and, more is always better. Now, how can that be? Some people have fortune without having achieved anything (e.g., inherited wealth) -- others attained fortune by less-than-respectable means -- others got lucky and some got dirty. I'm not intending to distract from those who have achieved wonderful things and been rewarded for it. My point is that it doesn't matter much how it is achieved or how it is managed. Instead of a reward for achievement, fortune is more often a concept that is used to motivate the masses to support those in the hierarchy who control the wealth and resources of the planet. It doesn't seem to be fertile ground for Taoists. They would not likely chose to run enterprises for profit at the expense of the planet's resources and contrary to the welfare of the people. For the Taoist, achievement is measured in the heart. I'm impressed with the likes of the Buddhist monks who create stunningly beautiful artwork, but never sign them. The work is a meditation, creation is the reward -- recognition is unimportant, quantifiables have no value. Such idealistic practices may not be practical outside of a monastic environment, but they provide some guidance for a higher understanding of achievement. It gives me comfort and inspiration to know that such beings are walking quietly among us. Fame seems problematic, as well. Who needs it? Entertainers and politicians? The magicians? Fame is usually fleeting, unless it's for something you'd rather have forgotten, is not linked generally to noble achievement, and rarely follows the graceful soul. Again, it doesn't seem that the Taoist would seek celebrity or high office. A bigger issue for me is giving up power. "If you can empty your own boat ... no one will oppose you, no one will seek to harm you." As the Tibetan monks have been devastated by the Chinese government, I'm concerned that the Taoist would get run over in our culture. Realistically, there will be those holding the potential to harm you, though I think one becomes a smaller target. Protection is important - it's naive to think otherwise. The important question is: "How?" It's a question worthy of further consideration on its own. Most forms of fame, power and achievement are manifestations of ego -- not just the obvious sorts, but the more subtle forms also. I started grad school, as many do, with a burning desire to cure "something" -- I thought it was a noble goal. Imagine if I had cured Alzheimer's Disease -- would not my life have been worthwhile? Yet, if having a cure for the disease were truly the desire, I would have been delighted if a competing lab had stolen my work and used it to find the cure. But, truthfully, that's not the way it was for the "I" needed to be the one to find the cure for the "me" to be satisfied. And, of course, it would have been better had I become wealthy and won the Nobel Prize in the process. That's ego -- pure and simple -- cloaked in a noble cause. The intention was sound, but the motivations were flawed. There's also a problem in that we don't live or work in a vacuum. There are usually innumerable people, present and past, who contribute to any endeavor. Who should get the credit - the reward? Thus, many conscientious scientists use the inclusive pronoun "we" when referring to any work that had been done -- even if the "I" had been the only one around in the middle of the night when a particular work was done. The "I" is motivated by the ego's need to be recognized. Just take a look at the skyline of Manhattan or any other major city. Capitalism depends on it. Many worthy causes are met -- patrons donating money for hospitals that will bear their names. Thus, one of the strengths of capitalism is that it focuses on results. A weakness is that results are usually defined in economic terms while the means, intentions, and motivations are often subordinated. So, many of the cures for disease are discovered by highly egoic scientists driven by self-interests of fame and fortune and then sold to other self-interested entities such as the pharmaceutical companies that are focused narrowly on profits. It seems to work at some level until the we realize that the person who has the disease and whose taxes paid for the research to cure it, often can't afford it. It's a bad rap for most scientists who, in my experience, tend to be rather humble and diligent. But, the system is setup to favor the more aggressive achiever. Those motivated by ego tend to compete best when talent and good fortune fail. I only use medical research as an example because that is an arena in which I am familiar - from all appearances, things seem far more perverse in banking, legal and political sectors, for example. It's beneficial to be empowered by fortune in this country - though, as mentioned above, fortune often does not correlate with deserving in terms of achievement. A self-sustaining cycle favoring the few is created at the expense of the many. Fortunately, the ego can seemingly be satisfied for some, if not for others. Some reach a level of success where they can relax and begin to "give back" while others continue to push for more and more symbols of success and recognition. We tend to motivate ourselves through the ego. That's worked to make the United States such a powerful nation. Yet, the basic concept is flawed due to greed, excess and fear of scarcity. As the structure of the country matured, the impurities of the design flawed the end product yielding exploitation in many shades and levels of severity. It's been a stage in our collective learning from which we are about to graduate -- though perhaps, without honors. The empty boat is a metaphor for a person without egoic form. But, the Taoists' approach doesn't imply a life that is dwindled away. S/he simply isn't motivated by egoic needs, isn't concerned about how the "I" is perceived, and doesn't attempt to usurp resources or overpower others. Manifestations are created in the "land of the void" -- the no man's land of no ego. The "I" has died, but the boat continues along it its way, manifesting from pure consciousness. We're still left with the question of whether it can work in Western culture. When I look at the world's issues, I think it's the only way that might. Place the fear aside. The current world structure that has achieved beyond our collective dreams is failing. The power needs to shift from outside to within to permit an evolution to a higher paradigm. The changes will unfold quietly for those who choose to perfect the new matrix. Watch your step! The transition to the empty boat may be a little tricky. Question your instincts and training -- hear your intuition.